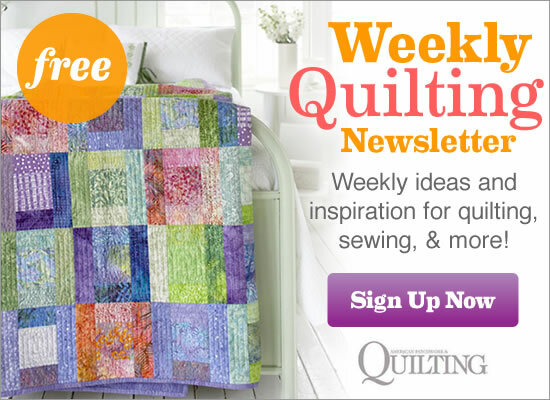 See the featured quilts and web-exclusive color options and projects from the American Patchwork & Quilting August 2016 issue. The August 2016 issue of American Patchwork & Quilting is on sale from June 7--August 3. Meet quilting superhero Jenny Doan, whose contagious energy has sparked a main street makeover. She and her Missouri Star Quilt Co. team are quite literally the fabric of small-town Hamilton, Missouri. See more pictures of our time with Jenny Doan here. In this big block throw, scrappy teals, corals, and golds mix with white for a fresh palette. Foundation piecing makes it easy to get sharp teal and coral points. The background of Star Bright, Star White becomes dark and dramatic in quilt tester Laura Boehnke’s version of the quilt. Laura’s use of light to medium oranges and green tone-on-tones makes the center star and outer points of each block glow against the dark background. Inspired in both color and form by a palace visited during a memorable trip to Europe, this pieced throw has plenty of texture thanks to nubby wovens—including chambray and linen—and dense quilting. A French flower market photo elicits a wall hanging of Snowball and Shoo Fly blocks, stylized rose appliqués, and a steel gray ground. If a quilt could talk, what would this antique coverlet say about its unlikely sashing colors of blue, purple, and orange? Was it intentional or did fabric colors change with age? Regardless, there is no doubt that this worn scrappy treasure was well-loved. While this variation on Rail Fence blocks is simple to sew, it is the sheer number of itty-bitty pieces in this project that impresses. Create pieced backgrounds for adorable Scottish terrier appliqués. Add interest with rickrack, pieced binding, and hand embroidery. Quilt tester Laura Boehnke cut her Scottish terrier appliqués from flannel to add texture. Instead of needle-turn appliqué, she fused and machine-blanket-stitched them in place. Set the table for summer with a curve-pieced table runner. Bright white sets off citrus-color segments, and a facing edge instead of binding furthers the clean, crisp look. Fabrics: Folio Basics collection by Color Principle for Henry Glass & Co.
Stitch a tiny yet vibrant table topper showcasing machine-appliquéd flowers, yo-yo flower buds, and an easy-to-piece border. Quilt tester Laura Boehnke created a garden of blues and purples for her variation on Fantasy Garden. Using only these tones emphasizes the green stems and leaves and makes the large flowers in each corner pop. Laura omitted the yo-yos in the border but kept them in the quilt center. Beautifully woven textiles of Swedish origin inspired this intricate quilt. Alternating bright print and white squares establishes a woven look in this table runner. Using large-scale florals for some of the white prints provides variation to the color sets.